Cape Cod is primarily a beach holiday destination and the best beaches include the Nauset Light Beach and Coast Guard Beach of Eastham, as well as the other three beaches that make up the protected stretch of the National Seashore. Visitors should note that there is a fee for visiting any of the National Seashore Beaches, but the spacious, unspoiled seashore is totally worth it. There are also numerous public beaches, like Craigville Beach, Sandy Neck Beach, and Sea Street Beach in Barnstable, but these do tend to get crowded during the summer tourist season. Many beaches in Cape Cod are for residents only. Those travelling with children should bear in mind that the bayside beaches are far calmer and more protected from the elements than those on the oceanside, making them safer family destinations. The summer months, between June and August, are the most popular, but those visiting at this time should come prepared for crowds and traffic-filled roads, booked-out accommodation, and high prices. Otherwise, come in the off-season when the colder beaches afford solitude and the towns have quietened down. 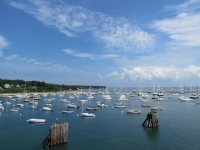 Cape Cod is also the gateway to the beautiful vacation islands of Martha's Vineyard and Nantucket.